This is such a rare occurrence that eyebrows tend to raise whenever it happens, with a few alarmist explanations and daft conspiracy theories usually quickly lobbed in the mix via Twitter. Whenever we think a site is down the first place we go is the excellent ‘Down For Everyone Or Is It Just Me?‘ website which checks the site for you and gives the straight dope on the site’s status. In this case, the message came through loud and clear: the BBC site is currently most definitely borked. We’ll update this article as soon as we find out what the chuffing heck is going on with the Beeb – we’ve checked their Breaking News Twitter feed and there’s stil nowt on that. We’d take that with a ton of salt for the moment as we’d be very surprised that such a huge site could be completely taken down so swiftly. 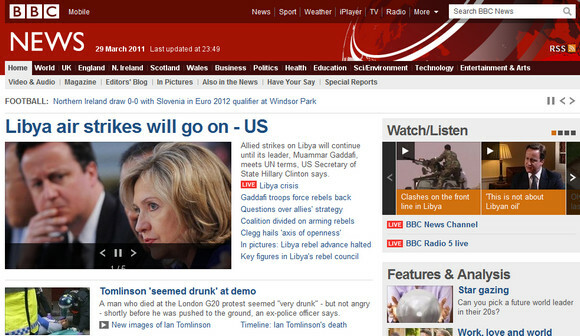 Update 23:32 29/93/2011 – Over half an hour later and still all the BBC sites are down. BBC6 Radio has said that they are “having problems” but didn’t go into detail. Update 23:50 29/93/2011 – It’s back! Huzzah – it’s back online! Join the discussion about the outage and recall the gnashing of teeth as folks battled to get their iPlayers working on our bulletin boards. I’m watching Iplayer now, however, I can’t access the BBC via a new tab or window? Wonder if they’ll even mention it …. what’s that noise? its coming from the …. Down for me too. I didn’t think the BBC would suffer from this – I had to go searching as I thought me PC must be wrong. What is going on! The BBC should be solid as a rock. Most of the comments are suggesting DNS issues. I don’t care how good these (presumably) crackers are you mentioned, you don’t just “take down” the entire BBC web presence. They’re not on Fasthosts shared hosting. Agreed here. Either an attack, DNS failiure or summat else. It’s very easy to take down a website as poorly maintained with ancient equipment such as the beeb’s. The ios’s maybe upto date, apache is not impenetrable, and bind is bind. Inject away, xss as much as you like. This kinda stuff is here to stay. BBC Worldwide and BBC Online were scheduled to close / remove several online services today due to cuts. It doesn’t take a genius to put 2 and 2 together and realise someone has made a massive mistake. Likely when one or more of the services were being brought offline and the DNS records updated someone has corrupted the DNS entry. Since almost all services for the BBC Bottleneck through the bbc.co.uk domain it is therefore likely that this is the case. If this is indeed the case then the DNS entry will need to be fixed and the DNS Caches will have to update which can take up to 72 Hours depending on ISP.